Ordinary days? Really? I’m not sure the term applies. As is the case with moving, our lives have been in transition. The last few weeks have been full of last times and goodbyes, packing tape and boxes. This weekend we were welcomed into a community and church family that has been battered by severe weather. My new office, a victim of the latest tornado, was damaged before I even moved in. Our first nights have been spent in someone else’s home, a temporary solution while our house in Texas sells. My first day on the job spent moving wet furniture and ruined supplies from our children’s area. Our days have been decidedly un-ordinary of late. Which makes this point in the liturgical calendar all the more interesting to me. As Trevor pointed out yesterday, the word “ordinary” implies certain things. Average. Humdrum. Run-of-the-mill. So why would the majority of the calendar fall under this category? Ordinary isn’t inspiring. It does not motivate us. We have this idea that ordinary does not matter, that we endure the ordinary to get to the really important parts of life. But even though we think “ordinary” is synonymous with “boring”, it means so much more than that. More accurately, it means frequent, familiar, normal. Everyday. 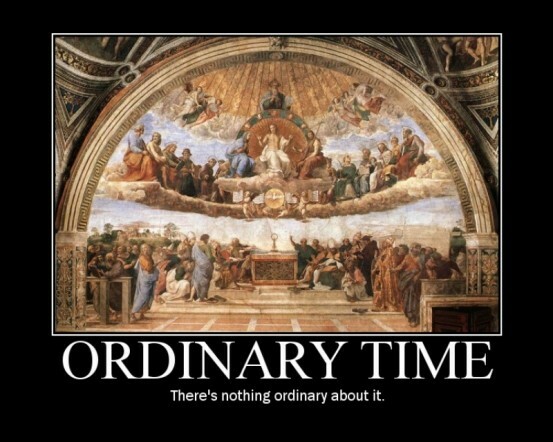 Ordinary refers to the things we encounter on a regular basis. It is our routine. Ordinary is what fills our days. Ordinary is not a step stool to the point. Ordinary is the point. I have so enjoyed the last 6 months that we have journeyed this liturgical road together. The anticipation of Advent bolstered the celebration of Christmas and Epiphany. The dirge of Lent only amplified the joy of Easter. But it will be in the next 6 months — these average and normal days — that the anticipation and joy, the death and rebirth will truly become real. Because while we enjoy the special, that is not where we live. We reside in the routine and everyday. As we begin this portion of the calendar, the words of Jesus in John 10 ring in my ears: “My purpose is to give them a rich and satisfying life.” The way of Jesus is not boring or mundane. But it can be our normal. His goal is to made our ordinary decidedly un-ordinary. So as we continue this journey, may your average days be filled with the echoes of the previous seasons. May the realities of Christ our Savior enrich your life. May you move from death to resurrection on a daily basis. May our lives be filled with the celebration of following this Jesus who truly wants us to experience life to the full. May these ordinary days be wonderfully un-ordinary.